In these challenging times for businesses, it is hard to get noticed by the general public. Secma and Qpod cars make an exceptional advertising tool. Being so unique and unusual, they make the ideal promotional asset and gain the maximum amount of interest, thus raising awareness for your campaign. Please email us or call us on 01508 499 232 with your questions and to discuss your individual requirements. The panels are easily customised and designed with your company colours and logo or slogans as desired. As a result, you will be in possession of an eye-catching marketing device that not only makes an impressive statement, but which also attracts a lot of attention. QD stores have been one of the few success stories over the last 24 months. Because of the nature of their business, they have enjoyed a surge in popularity and have consequently found themselves in a position to acquire many of the redundant Woolworths stores in the Eastern Region. 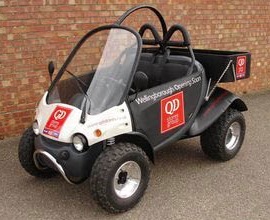 Needing to quickly and uniquely promote their new stores, QD became aware of the Secma products and hastily contacted Cunninghams who were immediately able to supply them with both the Qpod and the newest vehicle in the range, the F16. They have both been used most effectively as a promotional tool in their advertising campaign. The cars have been ideal for driving around town at new store openings, accommodating the Cheeky Girls, distributing leaflets and delivering much needed supplies. QD Managers have been more than happy with the interest that the vehicles have sparked and they are a huge talking point as, of course everybody wants a ride! Recently QD Stores have started using the Secma F16 in particular which has proved much loved by The Cheeky Girls and the QD team. Cunninghams is proud to sponsor Hempnall Football Club that uses the Qpod as a practical grounds maintenance vehicle and also as a promotional club mascot. If you are a busy farm, your business runs seasonal shoots, you own an equestrian Centre, you have a business associated with land management, or you own land which is regularly visited by the public, the little Qpod is deceptive. This impressive vehicle will take you over rough terrain, will pull substantial weights, take you to places that a quad will take you, yet in safety, and work its heart out for you and your company.